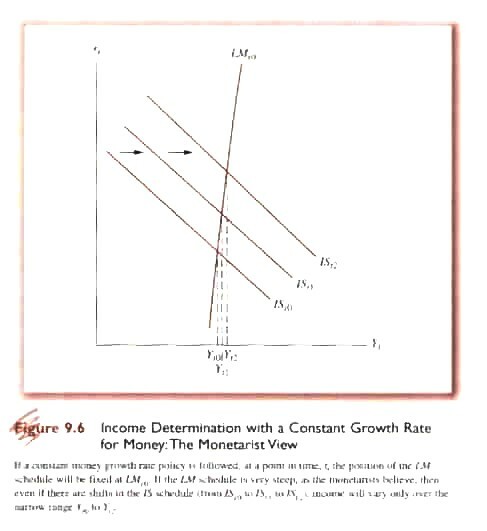 (9.1) Md = kPY where the demand for money is a function of ‘nominal income’, i.e. the P level times real income Y, and where k is the assumed ‘stable’ or constant proportion of nominal income held as cash. (9.3) MV = PY where V is also assumed to be constant. Keynes had assumed that assets or wealth (Wh) would held either in the form of cash money or other assets, specifically an homogeneous category called ‘bonds’, i.e. interest earning financial assets. The key for Keynes in determining how much would be held as cash and how much as bonds was the interest rate. Put another way, k would vary with the interest rate (r). If r rose the speculative demand for money would fall as would transactional demand. If r fell the demand for cash would rise. 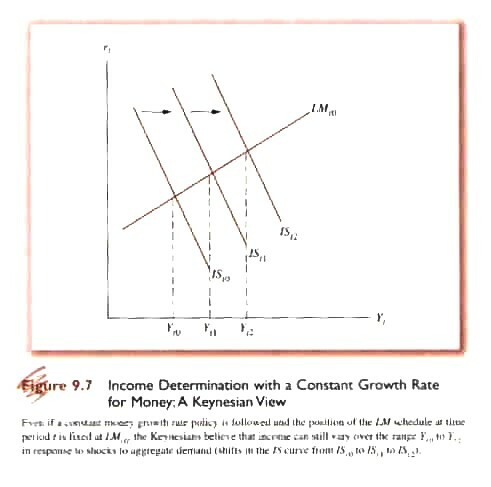 Given that k was now treated by Keynes as a variable rather than a constant the equation of exchange could not be used to generate a theory of nominal income. It was this conclusion that the Monetarists contested. - on durable goods including real estate, works of art and other physical assets (D) known as appreciation. According to the Monetarists any increase in any one of the 3 types of r would result in a decline in the demand for money but would be offset by compensatory decreases in one or both of the other rates of return thereby keeping k stable. For example, when the price of stock equity went up, the price of bonds would tend to go down. c) for Keynes, Wh was composed of cash and a homogenous category of interest earning assets called bonds. For the Monetarists, there were different rates of return for different ‘financial’ assets, e.g. bonds, equities and durable goods. where k is no longer a constant as in the Classical Model but rather a variable dependent on different rates of return. An increase in any of them will cause k to fall but overall they balance each other and k remains relatively stable. Given the Monetarist assumption that the demand for money was stable an increase in the money supply would require either that PY rise or that rB, rE, rD fall causing k to rise. To the degree that a change in the money supply results in a change in PY, to that degree, the quantity of money is important in determining nominal income. (9.6) PY = (1/k) M, i.e., nominal income (PY) is equal to one over k times the money supply. For the Monetarists, the other factors in equation 9.5 (rB, rE, rD) were assumed to have little effect on the demand for money approximating a constant, i.e. money or cash holdings (k) would be nearly constant. The Monetarist view is shown in Fig. 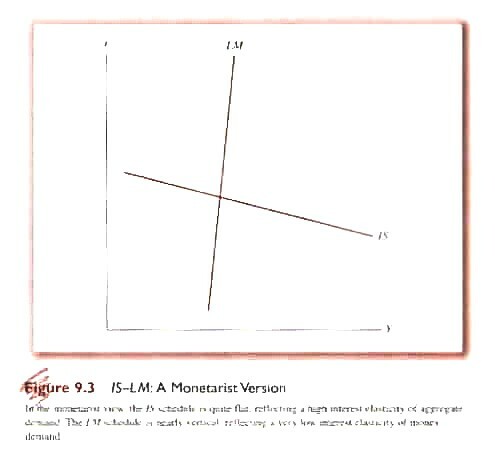 9.3 where the LM curve is very inelastic reflecting the assumption that k is a near constant, i.e., the demand for money is relatively inelastic with respect to collective changes in rB, rE, rD . By contrast, the IS curve is very interest rate elastic (gentle slope) reflecting the Monetarist assumption that aggregate demand is very sensitive to changes in interest rates. This can be contrasted with the Keynesian Model in which LM is relatively interest elastic while IS is relatively interest rate inelastic (Fig. 9.2). The LM and IS curves are, of course, shown assuming the price level is constant. The Monetarist, on the hand, believed that the price level was variable. 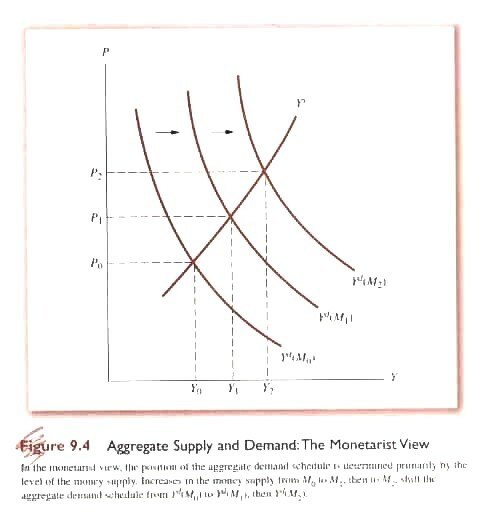 The effect of the Monetarist assumptions – stable demand for money, interest inelasticity of demand for money, interest elasticity of investment and savings plus price level variability - on aggregate demand is shown in Fig 9.4 where an increase in the money supply results in an increase in Y and P. In essence, the Monetarist position is that significant change in nominal income requires changes in the money supply. Left unanswered is what determines the nature of the aggregate supply curve and therefore the effectiveness of changes in the money supply. The policy implications of the Monetarist Model for fiscal and monetary policy are quite different from the Keynesian Model. 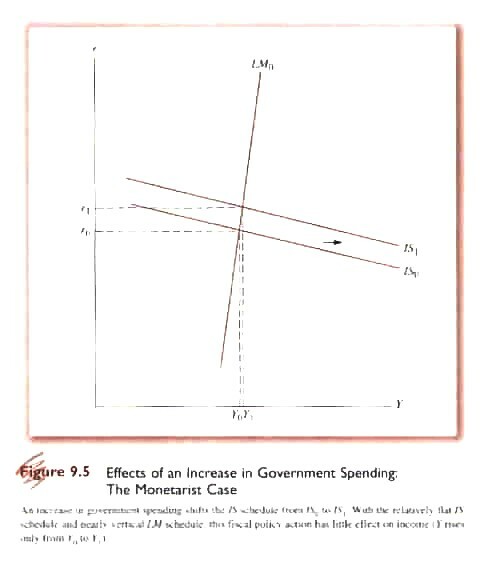 Assuming government increases G without raising T, it must finance the resulting deficit either by printing money or borrowing on financial markets (Fig. 9.5). An increase in G shifts the IS curve up to the right. Accepting the Monetarist position regarding the slope of the IS and LM curves then the shift in IS results in a relatively significant increase in the interest rate (r0 to r1) with a very slight increase in Y (Y0 to Y1). 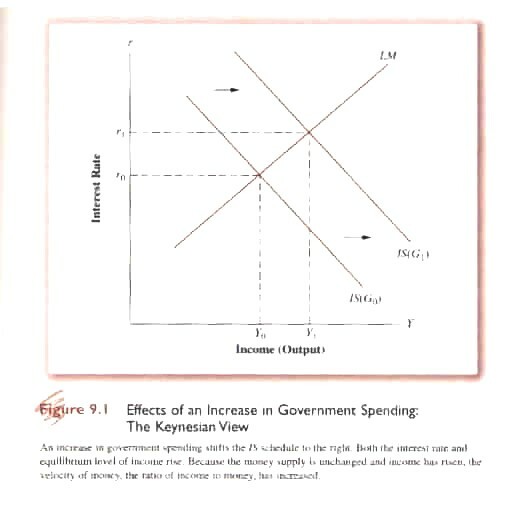 In effect increase government borrowing raises the interest rate causing private investment to decline (crowding out) thereby minimizing the impact on Y of increased G. This can be contrasted with the Keynesian Model shown in Fig. 9.1. To the Monetarist instability in Y resulted, not as in the Keynesian Model from instability of private investment, but rather from instability in the growth of the money supply. Accordingly the best thing that the monetary authorities can do is to increase the money supply at a relatively steady rate, i.e., by a rule rather than at the discretion of policymakers. 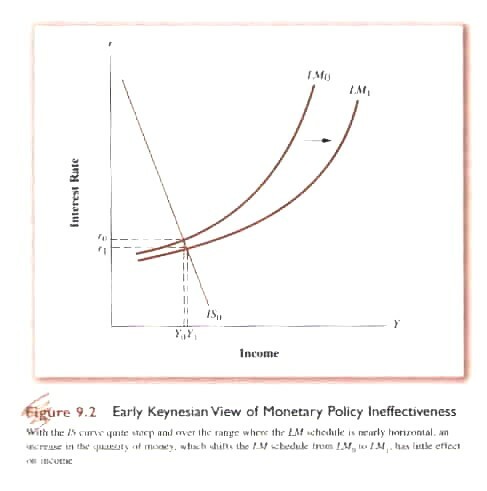 Accepting the Monetarist assumptions about LM and IS, changes in the IS curve, e.g., increases in G or X, will have limited effect on Y but significant effects on r and P. A stable increase in the money supply will mitigate inflationary pressure without introducing additional instability (Fig. 9.6). Increases in the money supply also need to be stable because of imperfect knowledge about aggregate changes in the economy. Thus given current theory and information it is not possible to accurately predict the future state of the economy and using discretionary monetary policy to significantly affect aggregate demand would introduce further instability into the system. Thus the Monetarist position amounts to an effort to stabilize the economy rather than affect its growth. The long and short of it is that the Monetarist Model calls for limited changes in fiscal policy because it only crowds out private investment and a steady rate of increase in the money supply to stabilize rather than manipulate economic growth. The contrast with the Keynesian position is evident in Fig. 9.7. In other words, like the Classical Model, the Monetarist Model calls for minimum government intervention in the economy.